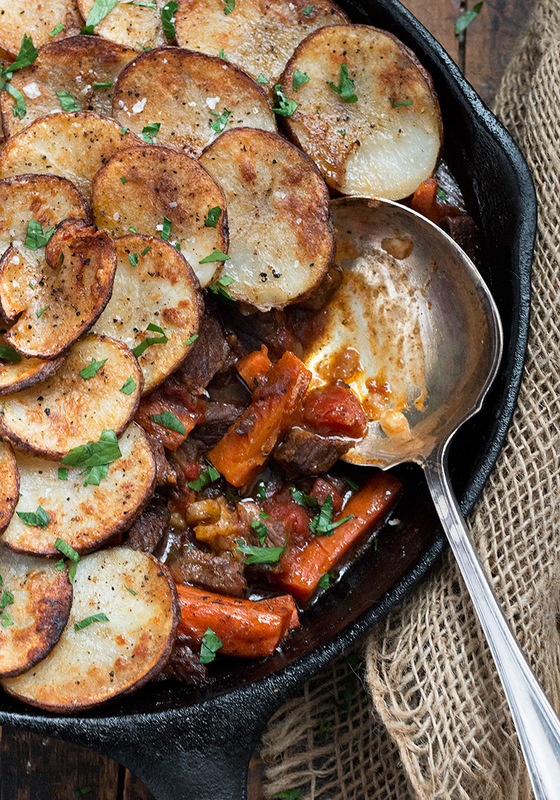 Delicious, hearty and one-pan easy, this Warm Spiced Beef Hot Pot pairs warm spiced beef, tomatoes and carrots with a crispy sliced potato topping. If you are waking up to a return to Winter this morning, this dish is just what you need! 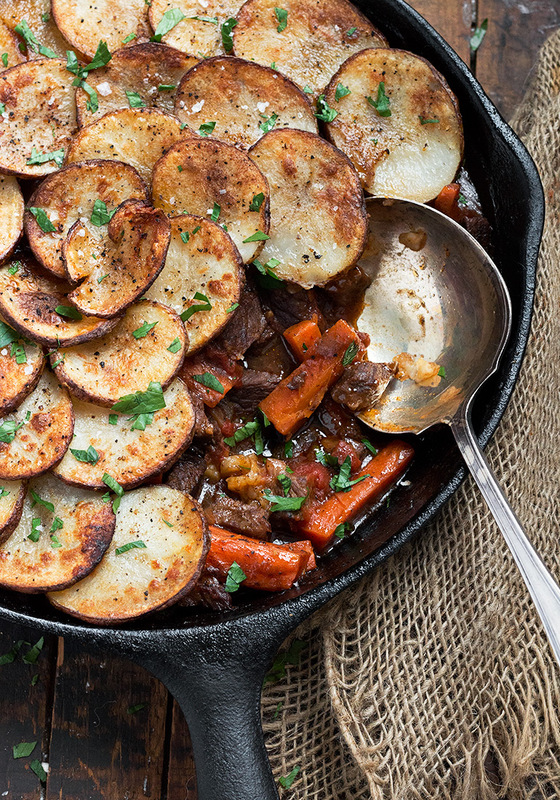 This hearty beef hot pot uses a somewhat unusual blend of warm spices, but it creates such a lovely stew and something just a little bit different from the usual. Carrots and canned tomatoes also add great flavour to this dish. And of course, it’s all topped off with crispy, golden sliced potatoes for a one-pan, all-in-one dinner! While this dish does need an hour and a half or so in the oven, it doesn’t take too long to put it together, so once it’s in the oven, you are freed up until it’s done. 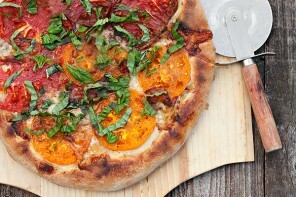 When it comes out of the oven, as it’s an all-in-one dish, there’s nothing else you need to make for a complete meal. You can start this dish with stewing beef cubes, or any larger piece of beef steak, trimmed and cubed. Don’t have or want to use wine? Replace with 1/2 cup beef or chicken stock with a splash of red wine vinegar. I didn’t peel my potatoes, but just scrubbed them well before slicing. You can certainly peel if you like. I used diced tomatoes here, but crushed or even hand-crushed whole canned tomatoes would work just fine. 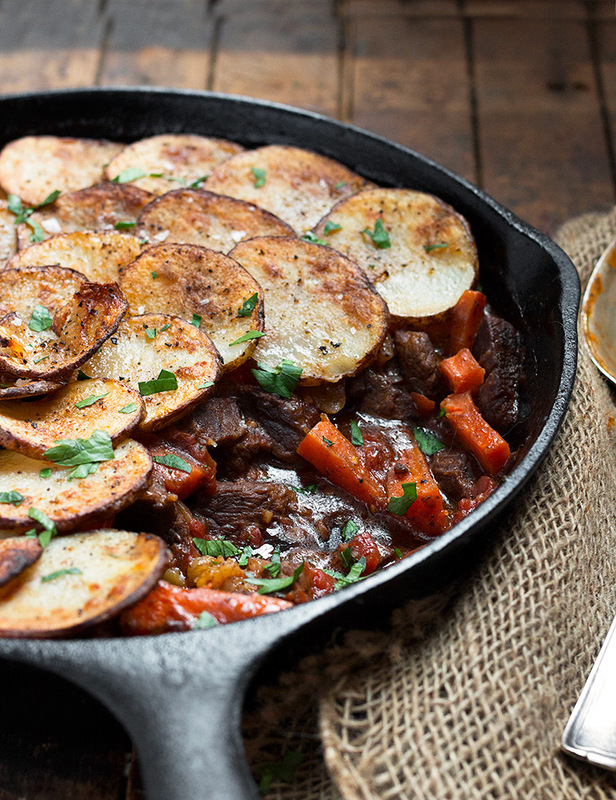 Delicious, hearty and one pan, this beef stew uses warm spices for a lovely flavour. The added carrots and tomatoes, along with the crispy, golden potato topping, makes this an all-in-one meal! Season beef cubes with salt and pepper. In a large oven-safe skillet, add 1 Tbsp. olive oil and brown meat in batches over medium-high heat. Do not crowd the pan, or the meat will steam in it's juices instead of searing. Two batches works well here. Remove the first batch to a plate while you cook the second, then remove the second batch to the same plate. Reduce heat to medium-low in the same skillet. Add an additional 1 Tbsp oil to the pan. Add the carrots and onions and cook, stirring regularly for about 5 minutes. Return the beef to the pan, along with any juices. Stir to combine. Sprinkle the cinnamon and allspice over-top and stir in. Cook, stirring, for 1 minutes. Add the tomato paste. Stir in and cook for an additional minute. Sprinkle the flour over-top and stir in. Cook for 1 minutes, then add the wine. Increase the heat under the pan to medium and bring the sauce to a simmer a couple of minutes, stirring to scrape up any brown bits from the bottom of the pan. Add the canned tomatoes and their liquid and the bay leaves to the pan. Return mixture to a simmer, then remove from heat. Arrange the sliced potatoes in a spiral on top of the beef, starting around the outside edge and over-lapping slightly. Brush well with about half of the melted butter and sprinkle with a generous sprinkling of salt and pepper. Cover the skillet with a lid or aluminum foil and bake in the preheated oven until potatoes are tender, 1 1/2 - 1 3/4 hours. Remove from oven and switch oven to broil, with rack about 6 inches from heat source. Brush the potatoes with the remaining melted butter and set in oven under the broiler until golden brown, about 5 minutes. Allow to stand 5 minutes before serving. 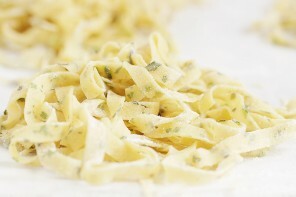 Garnish with chopped parsley, if desired. I’ve made this recipe 2x, and beats any beef like stew hands down! The second time I took a few more liberties, adding chopped swiss chard and poured it over spaghetti squash. I also upped the amount of cinnamon & allspice, because well, we just LOVE the flavour with the beef. Just a wonderful, wonderful recipe, thank you so very much! So glad to hear, Cindy. Sounds lovely :) Thanks! This recipe is a gift from heaven! The recipe was easy to follow and my husband and I devoured every last bite! Oh my gosh, I could do a face plant in this gorgeous pan! Your top picture fills my whole laptop screen and it’s all I can do to keep my mouth closed, haha. So beautiful, Jennifer! Your photos are extra stunning (how is that even possible?) LOVE! 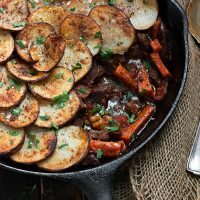 I just would like to do updated after I made this recipe that I was worries about looks like too much for sliced Potatoes on beef. But that was brew me away ! It is so good flavor even if I just only using Salt and Pepper as recipe said. It didn’ t matter a lot of potatoes or not. It went very good ! Beef and vegetables are so tender ! Excellent ! 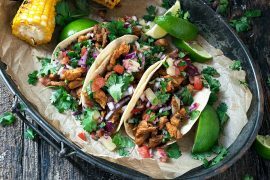 Thank you for your another yummy recipe ! I was decide make this tonight and going to baking now. You can think of me about armature or anything you like it ,but ….I’m wondering……When I finished assembling 2 lb potatoes slices on beef, It was tremendously BUNCH of Potatoes that I have to do . I was just following like your recipe cut 1/4 size slicing on top of beef. But still bunch, And also I couldn’t butter on every single potatoes. (it doesn’t looks like your picture at all ) So I just did surface of Potatoes only. 2 LB potatoes and slicing more number made it…… Oh , well, I just baking now , so let’s see how it goes. It’s been winter here since the weekend, so you know I’m in need of some seriously cozy eats! And this hot pot would TOTALLY hit the spot! Those crispy potato slices on top are perfection, Jennifer! So.Much.Drool! Cheers, friend! This is just the kind of dish we need right now Jennifer. It’s been so cold and this would warmest right up! It’s so nice and hearty and comforting. Love how you spiced this dish up Jennifer, cinnamon and allspice with tomato paste sounds amazing. I bet this was fabulous! This looks delicious! I can’t wait to make it for supper tonight! Thank you! It was wonderful! Thanks! I have two boys, 7 and 4, and they both enjoyed it. My oldest said to keep the recipe and make it again. It was perfect for a cold night. We do indeed have a winter relapse this morning! Ice hanging from the tree buds, a bit of snow on the ground, but just enough to irritate and not be enjoyable. Oh well, it will melt quickly. 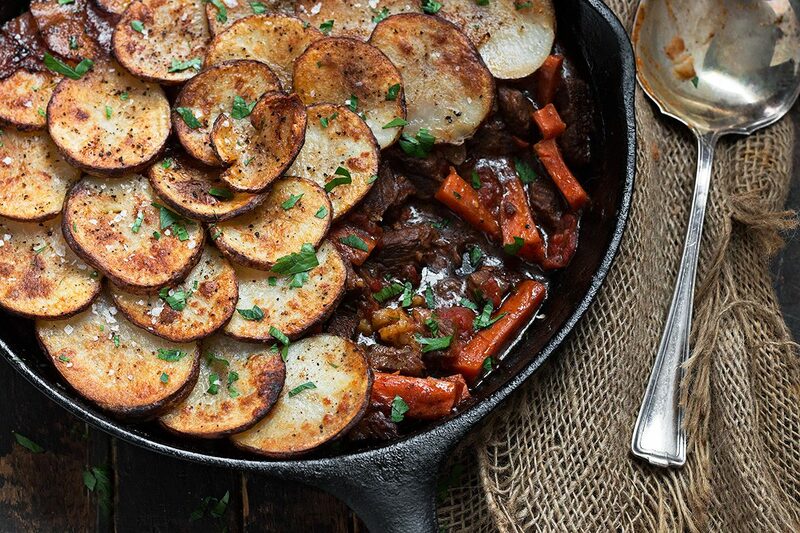 But given the snowy, blustery weather, I think I need this gorgeous dish of meat and potatoes on my table! I love the addition of wine and tomato paste and that wonderful array of crispy potatoes. Pure comfort food! Love the look of this ~ I make Lancashire (spelling??) Hot Pot all the time, but never tried it with beef, I just love the scalloped crust, pinning and sharing!